Among the things we learned this week: There is a US Open College Beer Championship. For making beer -- not drinking it. And, as it happens, a beer made by students from Schenectady County Community College's craft beer program -- Question Mark IPA -- won a silver medal in the open category of this year's competition. SCCC piloted a brewer training program earlier this year. And it's planning to offer a craft beer brewing certificate program and a craft brewing associate's degree program starting this fall. 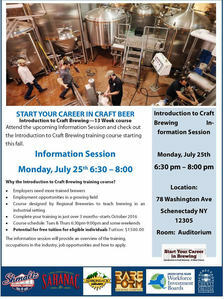 The college has an info session about its intro to craft brewing course lined up for Monday, July 25 at 6 pm at its campus in downtown Schenectady. The course is scheduled to start this October.